KIEV, Ukraine -- Ukraine's general prosecutor said Wednesday the jailed ex-premier Yulia Tymoshenko was cited as a witness in the murder of a deputy, putting fresh pressure on President Viktor Yanukovych's arch-enemy. Yulia Tymoshenko's image is displayed as her daughter speaks at a rally in Kiev. Ukrainian parliament member Yevgen Shcherban was gunned down at the airport in Donetsk in 1996 in a crime in which prosecutors have in the past implicated Tymoshenko and her ally Pavlo Lazarenko, who is serving a sentence in the United States for corruption. "Since an investigation (into Shcherban's murder) is ongoing, she is in the capacity of a witness," general prosecutor Viktor Pshonka told reporters. "A concrete investigation into the contract-style murder is ongoing," he said. Pshonka's deputy Renat Kuzmin earlier said that testimony had already been gathered from individuals pointing to Tymoshenko and Lazarenko as "the people who ordered and financed the murder". Both have denied any involvement. 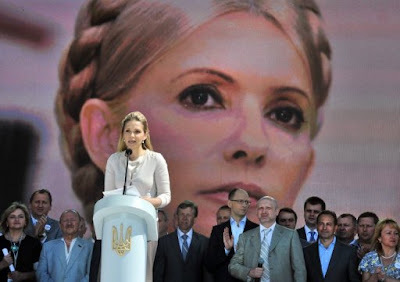 Tymoshenko, 51, is serving a seven-year sentence for abuse of power and now faces fresh charges that could extend her sentence to 2023. Her jailing prompted howls of international criticism. A driving force of Ukraine's pro-Western "Orange Revolution" in 2004, Tymoshenko lost the 2010 presidential race to Yanukovych but remains fiercely ambitious. Pshonka spoke after Kommersant-Ukraina newspaper reported earlier Wednesday, citing a source in Pshonka's department, that authorities were preparing to bring charges against Tymoshenko for her role in organising Shcherban's murder. "We have evidence proving Yulia Tymoshenko's direct involvement in Yevgen Shcherban's murder," the high-ranking source told the newspaper. "The collection of this evidence is continuing. We cannot bring charges against Tymoshenko for now because officially she's ill. As soon as she gets well, the charges will be brought (against her). We expect that to happen at the end of June, beginning of July." Tymoshenko, who has complained of back pains, has been hospitalised at a public clinic since May 9. Tymoshenko's lawyer Serhiy Vlasenko told reporters Wednesday that prosecutors are relying on testimony from Shcherban's son Ruslan, who is under pressure from the authorities. Ruslan Shcherban himself, he added, never publicly accused Tymoshenko of being involved in his father's death. The European Union and many member countries have threatened their officials will boycott matches in the Euro 2012 football championship that Ukraine co-hosts with Poland from June 8 to July 1.